What days do your tours depart? We operate every day there is a cruise ship in port at Tauranga. What time do tours depart? Our Rotorua Tours depart between 9 and 10am. Please be aware that these times may change depending on your cruise ship arrival and departure schedule. Where do you pick us up from? All tours depart from right outside the Port gates. It's just a short, easy stroll from your ship to meet your driver/guide for the day. All tours include transport, full commentary by our experienced driver guides, entry to the attractions listed on your particular tour. Lunch and beverages/refreshments are at your cost. Can you provide a Group Discount? Yes! We have a Group Discounts. Contact us for details. Can you customise a tour for me? We are more than happy to help - simply contact us with your requirements and let us put together a quote for you. I have mobility issues - can I still book a tour with you? Please let us know in advance if you have limited mobility (using a walking frame or wheelchair) - we can usually cater for your requirements. 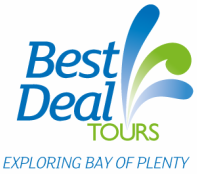 If you book a tour without advising us of your requirements and are unable to proceed with the tour (due to unsuitability of the tour or the vehicle provided), Best Deal Tours will not be responsible for any refund (either in part or in full). Will you get me back to the ship on time? Absolutely! Our tours are planned meticulously to ensure you have the best possible experience on your tour and that includes getting you back to the ship well before the scheduled departure time. 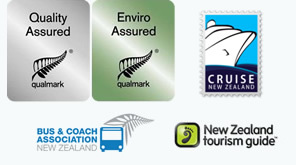 In the event of any unforeseen circumstances, we will transport you to the next New Zealand port for your cruise ship. Wear comfortable, light weight clothing and comfortable walking shoes. In New Zealand, the sun can be very harsh and we strongly recommend all passengers wear a hat and sunscreen (SPF30+). What should I bring with me on the tour? Your photo i.d. and ship card as Port Security is very tight and you may be required to show one or both forms of i.d. to re-enter the secure area of the Port. Remember to bring your phone/ipad/camera for those all important holiday photos. Most importantly - bring a smile and get ready for a fabulous day!